I do not normally post emails sent to me, but this one got to me. Maybe it is because it is so close to Remembrance Day. It might be that my Grandfather was a soldier and my children’s Grandfather was one as well. My Grandfather died when my Father was just a child. My children got to meet their Grandfather only a short time before he passed. Remembrance Day was also his birthday. They miss him and Remembrance Day is very hard for them. I don't believe in war being the answer to anything, but I respect the soldiers who put their lives on the line, and often their lives for us. 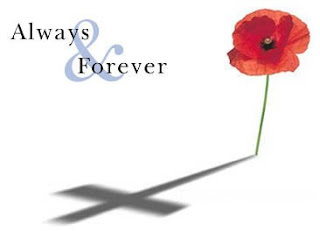 A poppy is a small thing to wear to show respect for those who have died, and those who did not. Yet respect has been earned and I for one wear my poppy with pride, mixed in with more than a little sadness. If you care to offer the smallest token of recognition and appreciation for the military, please pass this on and pray for our men and women who have served and are currently serving our country and pray for those who have given the ultimate sacrifice for freedom.